This project is directed at one of China's most species-rich forests, the Nanguanhe Nature Reserve in southwestern Yunnan province. Nanguanhe is not only one of the last remaining forest areas in China supporting elephants and tigers, but also the only one supporting the two gibbon species white-handed gibbons (Hylobates lar) and western black crested gibbons (Nomascus concolor). Nangunhe also appears to be the only forest in China where white-handed gibbons may still occur, although no direct evidence for their continued occurrence there is available since more than 10 years. Virtually nothing is known on the status of these gibbons in Nangunhe, and no systematic gibbon surveys have been carried out in this forest, so far. The aim of this project is to launch a census in order to assess the current distribution and abundance of lar gibbons in this poorly known nature reserve and to use these data to formulate recommendations for efficient protection and surveillance of gibbons at Nanguanhe. The Nando Peretti Foundation funded this project which aims at surveying the population status and distribution of lar gibbons within the reserve by means of setting up so called "listening spots" where surveyors spend a few days and record any oral or visual evidence of gibbons. Surveyers will be recruited from the reserve staff, local communities and the Zoological Institute in Kunming and briefly trained in surveying techniques. 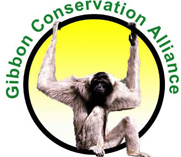 A questionnaire will be distributed among villagers to help identify potential areas of gibbon distribution, and awareness will be raised among locals by informing them about the plight of gibbons. 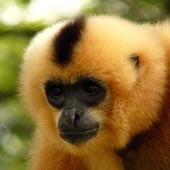 Locations of gibbon groups will be determined via GPS receivers and later digitally mapped. During the surveys, we also assess and compile the current degree of human encroachment (wood cutting, poaching, resource harvesting etc.) in and around the reserve. We have already received strong backup from both the provincial forestry department in Yunnan and the nature reserve administration which fully support our intended endeavour. The main outcomes will include detailed data on population size and distribution of lar gibbons within the reserve as well as preliminary data on habitat quality and habitat use of gibbons. All data will be made available to NGOs and decision-makers to ease future conservation strategies. Moreover, reserve staff will obtain skills and knowledge for further lar gibbon conservation, and it is our goal that gibbon conservation will be included into future nature reserve planning. 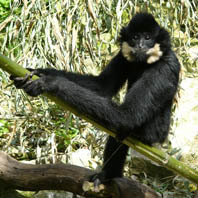 Support for lar gibbon conservation may be increased among decision-makers, and awareness about gibbons will be increased among local communities. A list of threat factors will be compiled and offered to the reserve management bureau and used as a basis for the development of efficient monitoring and sustainable management of the remaining gibbon populations at Nanguanhe. The possibility of primate-based ecotourism at Nanguanhe will be discussed as a means of generating revenues for the reserve.